Order a pair of trainers from the online Nike store and they can essentially be custom designed right down to personalising the text printed on the tongues. The trainers are still sold in set sizes but, with advances in 3D printing, running shoes could one day be truly customised to each person’s feet and running style. The American sprinter Allyson Felix has a pair of Nike spikes complete with 3D printed plate that were tailored to the biomechanics of her running gait – Nike, Adidas and Under Armour, among other sportswear brands, are all experimenting with 3D printing. Personalised products are now available – from luxury cars to creating your own jar of marmite. The idea of producing ‘lot size one’ is changing the way manufacturers work, and even a company like Bosch – which makes large batches of standard products – is seeing greater variation in the parts it builds. ‘Bosch faces a situation where it is more difficult to give an accurate projected figure for the number of units that will be made over the next 12 months,’ commented Wolfgang Pomrehn, product manager for the Apas family of mobile robots at Bosch. ‘In the future, lot sizes will decrease as products become more varied, which is a big issue for manufacturers,’ he added. Bosch has designed its Apas product family with changeable automation in mind. The production island, which was displayed at the Vision trade fair in Stuttgart in November, is engineered to be agile and to operate alongside humans – the machines can be loaded manually or automatically, and contain sensors that mean they shut down if a human gets too close, and then start again once the hand or arm is out of the way. One of the three models in the Apas product family is the Inspector, a mobile inspection unit with interchangeable camera and lighting modules, and machine learning algorithms that can be trained to distinguish between good and bad parts. Greater flexibility in manufacturing and catering for ‘lot size one’ is all part of what in Germany is referred to as Industry 4.0, or the fourth industrial revolution. This is a concept that revolves around digitisation of production. 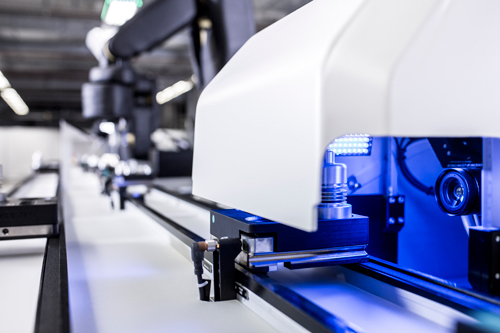 Factories are becoming better connected within their IT infrastructures, in order to increase product quality, production efficiency, and to make more complex products with shorter innovation cycles. In smart factories the product tells the production machine how it should be processed, through RFID or machine readable codes. At Bosch, data from the Apas production robots feed into the company’s manufacturing execution system (MES), which gathers information like the number of good versus bad parts a machine is outputting, and the number of defects in each component. There are advanced factories in operation – Siemens is heavily involved in digital production, as is Bosch – but in terms of machine vision systems or components complying with Industry 4.0, this is still some way off – Dr Olaf Munkelt, managing director of MVTec Software and chairman of the board of VDMA Machine Vision, told Imaging and Machine Vision Europe, at the Vision show in November, that this is likely to be 10 years away. Bosch’s Apas product family uses some image processing tools from MVTec’s Halcon software library – the two companies have been working together for around seven years. Stemmer Imaging has done some work integrating machine vision into the enterprise resource planning system SAP. In this scenario, an order is placed in SAP; the software then knows which batch is being manufactured and which inspection protocol needs to run. It also gets data back from the vision system about the number of rejects, plus images of the defects, and can compare this data with other information, such as processing time. 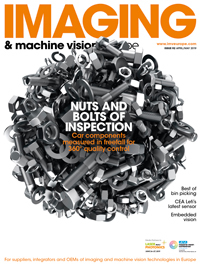 ‘Already, there are companies making interfaces between vision systems and the smart factory. However, there’s no real standard for that yet,’ observed Mark Williamson, director of corporate market development at Stemmer Imaging. The VDMA is working on a companion specification for vision for the OPC Unified Architecture (UA) standard to identify what a vision system should contribute to a smart factory. Williamson said that it could be another five to 10 years before there are standards in the machine vision sector, whereby an OEM buys a vision system that is Industry 4.0 compliant. ‘For components, Industry 4.0 is less important; for the systems business – compact vision systems, smart cameras and bespoke vision systems – that’s where I think those standards become a lot more critical,’ he remarked. Williamson said that data surrounding illumination – lifespan and intensity – was one aspect of a vision system where it would be useful to feed live readings back into the factory floor management software. ‘LEDs do degrade and it would be quite a compelling solution to say which lights in the factory are running at maximum output, and which are losing intensity. There could then be a maintenance plan in place for illumination,’ he said. The robotics manufacturer Kuka has produced its own Industry 4.0 framework for its robots, according to Williamson. A car plant with 1,000 robots can monitor how each is performing, and some users will send that information back to Kuka. This means Kuka can start to offer pre-emptive maintenance plans; it can see that the vibration levels for a particular robot are increasing and that a certain component needs to be changed. A similar idea could be part of a vision system offering, particularly relating to illumination levels. Part of the idea behind Industry 4.0 is that factories will be able to analyse all the data being received from the various machines on the shop floor to optimise the process. Most forward-looking factories will have a cloud computing platform, part of which will be for data analysis. Image data is too large to be sent to the cloud; instead it’s the measurement values and other inspection results or data trends that are generally cloud sourced. Bosch’s Apas Inspector module includes heuristic image processing functionality, in which the robot is taught the difference between a good and a bad part. The operator can mark areas in the image corresponding to defects and those where the part looks acceptable. In this way the machine can learn what the operator means by good and bad. This demonstrates the idea of bringing man and machine closer together. ‘We try to introduce more intelligent and flexible systems into production,’ Pomrehn said. ‘The machine learning software is part of the idea that we make systems to understand better how operators think.’ The user interface is a simple touch screen GUI, where the operator marks the regions in the image as being acceptable or defective. ‘This is an intuitive way to communicate with a machine,’ he added. The machine learning software was originally introduced for optical inspection of metal surfaces. The more part images used to train the system, the more accurate the results. The software can work with as little as five to 10 images, according to Pomrehn but, in practice, producing metal parts will always have some variation in environmental conditions. This could be a different material supplier or a change in the tool that processes the metal surface. It could be a change in temperature or humidity, or using a different lubricant to drill holes. Therefore, the surface can look a little different over a period of three to six months, for example. ‘The advantage of the system is that new images can be added into the training set over time to give very accurate results – the algorithm cannot be over trained,’ Pomrehn insisted. Apas Inspector is used mostly for end-of-line inspection because it is a stand-alone system. However, it contains a camera and illumination unit that can be taken out of the robot and put directly into the production line. Pomrehn said that this is done in Bosch’s plants for a suitable test phase of 100,000 to 500,000 parts, to convince customers that putting the camera and illumination in the production line works. ‘Vision is a powerful tool for Industry 4.0, because it gives a lot of information,’ Pomrehn commented. He added that the challenge is to interpret the images, which is the aim behind the heuristic image processing functionality in Apas Inspector.